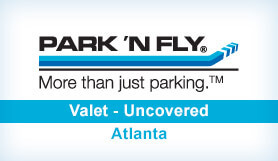 Offering both peace of mind and luxury service, Park ‘N Fly Plus valet service at Atlanta Airport is perfect for visitors in need of security and speed. Their deluxe customer experience includes a special text-based pickup system, premium luggage assistance and a shuttle to the terminal. They even offer extra packages, including Jiffy Lube servicing, a deluxe hand car wash, and boarding pass printing – so you can tailor your parking package to suit you and your vehicle. This parking option serves both domestic and international travellers. Park 'N Shine Car Wash and Detailing: Leave your car dirty, come back to it clean. Our Park ‘N Shine services includes a full wash and detailing leaving your vehicle like new upon your return. Luggage Assistance: Park 'N Fly Plus drivers are available to help you lift and carry your luggage on and off our shuttles. Park 'N Shine Car Wash and Detailing: Keep your car clean without having to make that extra stop. We'll wash it (and detail) just before you return. Jiffy Lube Signature Service® Oil Change: Get a Jiffy Lube Signature Service® Oil Change and vehicle maintenance at Park ‘N Fly Plus with the brand you trust and the convenience you need. Electric Car Charging Stations: Just plug in your car and go - it will be charged when you return from your trip. Please pull a ticket from the ticket machine when you enter Atlanta Park ‘N Fly. Simply text the number provided on your confirmation email and inform Atlanta Park ‘N Fly that you are in the Orange Zone, (Space Two) so they can retrieve your car from the secure lot. Please exit through the cashier booth when you’re ready to leave, while giving the cashier your name so they can terminate your reservation in our system.